Charles Hodges, Ph.D. is pictured working with a group of educators from Jenkins County. Teachers, paraprofessionals, administrators and other school personnel from Jenkins County Schools joined College of Education (COE) on Friday, June 2 for a One-day Maker Experience in the College’s Innovation Studio. Attendees from the Jenkins County Schools were given the opportunity to work hands-on with technology featured in the Innovation Studio including robots and 3D printing, as well as the web-based coding program, Scratch. Hodges, who teaches instructional technology, says it is vital to demonstrate not only how to properly use various technologies of today but also to directly apply how these innovations can be used in the classroom to enhance and expand instruction. “When educators work with us in the Innovation Studio, they see the ‘state-of-the-art’ technologies for schools and discuss how they can be used and integrated into their classes in meaningful ways by interacting with instructional technology faculty who teach and do research on these ideas,” said Hodges. 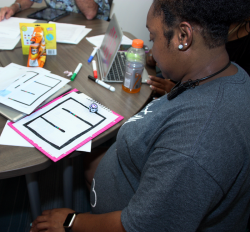 An educator from Jenkins County watches as an Ozobot, a small robot, follows lines she traced on paper and changes directions based on the colors marked on the path. Jenkins County Board of Education is in the process of constructing a new P-12 school facility, and Hodges explained that visiting school personnel were also interested in knowing what cutting edge technology could be included in their future classrooms. “Getting to work hands-on with the various technologies lets them see how they work, and gives them an idea of what might work in their classrooms,” he explained. The College of Education’s Innovation Studio is a makerspace dedicated to serving educators, students, staff, youth and local community members to foster a culture of innovation and provide experience with leading-edge technology. The studio houses contemporary equipment including 3D printers, a virtual reality headset, a large screen projection system, a television with video gaming systems, robotics tools and more. 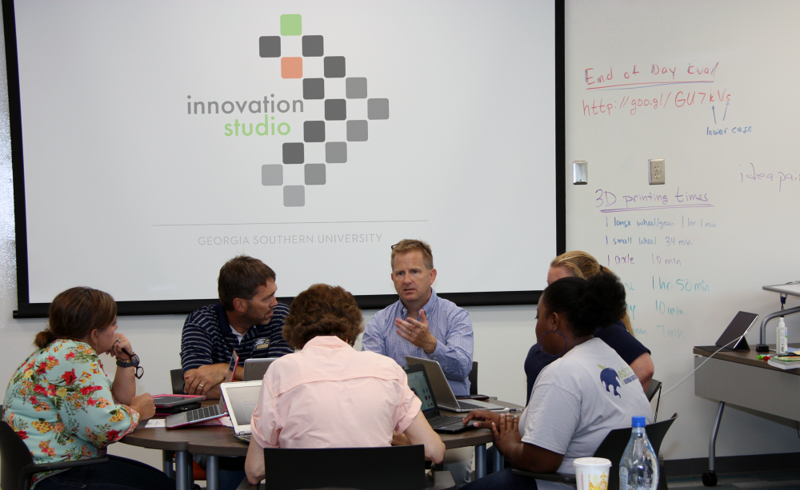 For more information about the Innovation Studio or to schedule training, contact innovationstudio@georgiasouthern.edu.